I'll preface this post by saying that it's definitely not your average InsideEVs article. There's no real news here. Rather, this is one of those rare posts where we decide to let you in on the behind the scenes action at InsideEVs. So, if you want to know how we roll, then read on. "The born electric BMW i3 represents a new era of electromobility. It is like no other car the world has ever seen. It offers visionary design, a ground-breaking vehicle architecture, dynamic performance and innovative connectivity. No other car represents such a holistic approach to sustainability throughout the value chain. 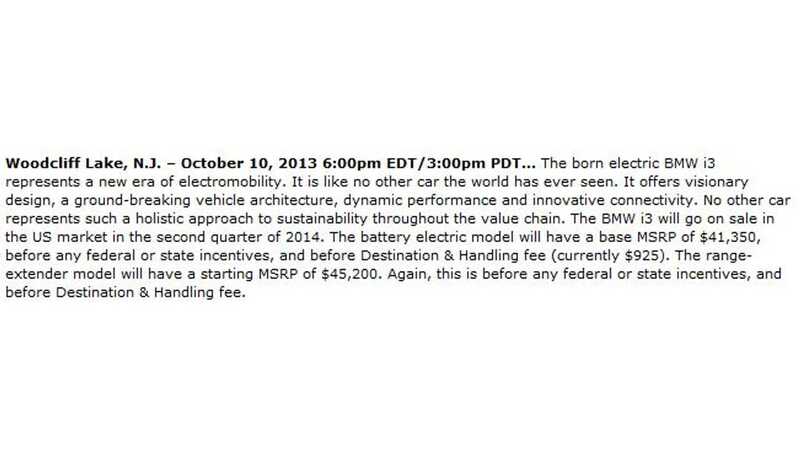 The BMW i3 will go on sale in the US market in the second quarter of 2014. The battery electric model will have a base MSRP of $41,350, before any federal or state incentives, and before Destination & Handling fee (currently $925). The range-extender model will have a starting MSRP of $45,300. Again, this is before any federal or state incentives, and before Destination & Handling fee." 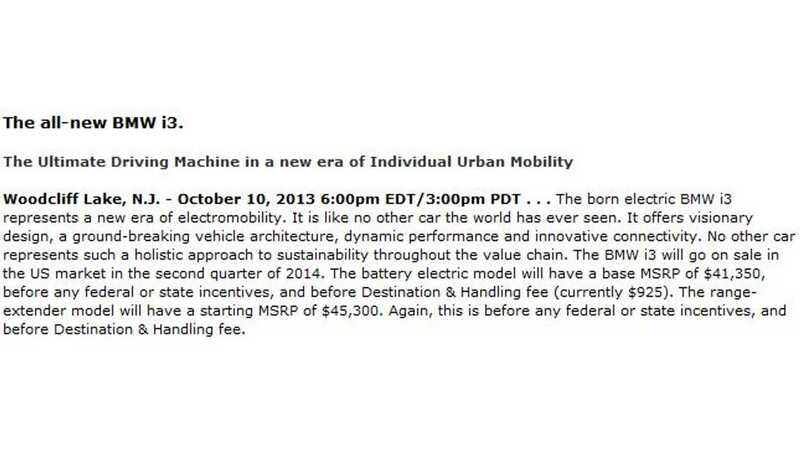 "Pricing (before federal or local incentives) starts at $41,350; $45,200 for Range Extender model. Destination & Handling Fee not included." Could this be true? Did BMW actually raise the price of the i3 REx by $100? It seemed crazy to us (Jay and I) that BMW would make such a minor pricing adjustment. The conversation between Jay and I got intense. At one point, we considered updating our pricing information on some 20-plus BMW i3 posts we have in the system (that's more work than you can imagine). Some further digging was in order. Jay went off checking every BMW site in existence (there are tons of them) to either confirm or deny the price change. I, on the other hand, went seeking my BMW source (who will remain unnamed at this time). Was it really the case that BMW had a typo in its latest press release? Yes, confirms our BMW source in the wee hours of this morning. The problem is, this pricing discrepancy has now hit the Internet and it's spreading like wildfire. InsideEVs was oh so close to following along had it not been for our sleuthing and late night conversation that may or may not have been carried out while this writer was walking his dog. 30 minutes of sheer confusion, followed by 30 minutes of digging and back-and-forth messaging (as well as some help from our BMW source) led to the conclusion that BMW issued its latest press release to re-ignite interest in the i3. The price of $45,300 was a typo. We all make typos, so we're not faulting BMW, but boy did the German automaker have us going last night. Rest easy folks. The BMW i3 with REx still only costs $45,200. BMW did not increase its price by $100. All in a days work, as I often say and had it not been for us wasting an entire evening (and all that brain power) over what amounts to nothing, this post wouldn't have found its way onto this page. But with all that effort put out by us, we just had to have something to show for it in return.